I started using Xmarks to sync my bookmarks between multiple browsers and computers so long ago that it may have still been called Foxmarks when I started using it. While I had a handful of problems with it from time to time–mainly with syncs failing and leaving my bookmarks corrupted in a given browser–the tool worked very well for me, so I was quite disappointed when LastPass announced that they were discontinuing the service back in May. Today I think I may have found my replacement in xBrowserSync. xBrowserSync is a open-source, anonymous, encrypted, and decentralized bookmark syncing tool that works a lot like Xmarks used to. xBrowserSync doesn’t do everything that Xmarks did, but it syncs bookmarks (which is the only Xmarks feature I ever used), works in Chrome and Firefox, and treats bookmarks as bookmarks (as opposed to making you have to access them through a website), so it meets my needs. There’s also Android support that I might check out. I added a few bookmarks in one browser after installing xBrowserSync to one of my machines today and confirmed that they synced to other browsers, so it seems to work. xBrowserSync is completely anonymous and doesn’t require any signup to use. Instead, you simply provide the extension with an “encryption password” that is used to create an encryption key, used to encrypt your bookmark collection before it is sent to the server. When you set up your first browser, the extension generates a unique “sync ID” that identifies your bookmark collection. On subsequent browser setups, you simply provide these two pieces of information and xBrowserSync retrieves and decrypts your bookmarks. Encryption and decryption is done in the browser via the cryptography API, and your password and encryption key never leave your browser. There are currently three public xBrowserSync service providers to choose from, which, combined with the fact that the code is all open source, helps alleviate concerns that this service may too go the way of Xmarks. If the developer decides to no longer support the project users will just need to move their bookmark collections to another service provider. Switching is easily done via the extension’s settings. The server code is also available on github, so it’s also possible to run your own server if you are truly paranoid. The only “complaint” I have about xBrowserSync at this point, now that I’ve installed it on several browsers on Windows, Mac, and Linux machines, is that when pulling down the bookmark library for the first time in a new browser, xBrowserSync wipes all of your existing bookmarks and replaces them with the copy from the server. This wasn’t a big deal for me as all of my bookmarks were pretty much in sync across systems already, but a first time user, trying to merge work and home bookmarks for example, might be in for quite a surprise when one of the two collections gets wiped out. To xBroserSync’s credit, though, the extension does give ample warnings about this. Complaints aside, xBrowserSync seems to do exactly what it says it will. If you’re still wondering what to do now that Xmarks is gone, give xBrowserSync a look. The SD card on one of my Raspberry Pi systems filled up recently, so I decided to wipe it and reinstall Raspbian. The main Rasbian distribution, however, is designed to help teach kids to code and includes lots of tools that I generally don’t use, so I decided to build it from scratch. The Raspberry Pi Foundation provides a light version of the Raspbian OS, which is intended for Pis used as servers or in embedded devices. 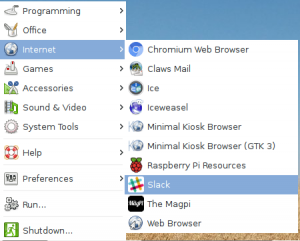 Raspbian Jessie Lite doesn’t include a graphical interface by default, nor does it include any of the various browsers, office tools, or programming tools that you’d normally expect to see on a Pi. It’s pretty much just the basic OS and the standard utilities you’ll to find on any Linux machine. To get started, download the latest Raspbian Jessie Lite image and use your method of choice to install it on your SD card. Since I’m working form a Mac, I usually use IvanX’s Pi Filler. Once the card is built, stick it in your Pi, boot up, and run raspi-config right away to set up your Pi and change your password. Since this is an advanced tutorial, I’ll assume you’re already familiar with raspi-config, so I won’t spend time on it here. If you need help, there are plenty of tutorials online. Now, I’ve never been a fan of the Raspberry Pi’s desktop environment, LXDE. I just don’t really like how it looks and it’s difficult to customize. PIXEL, the new implementation of LXDE on new versions of Raspbian is a little better looking, but I still can’t get into it. Instead, I much prefer XFCE, another lightweight desktop environment. 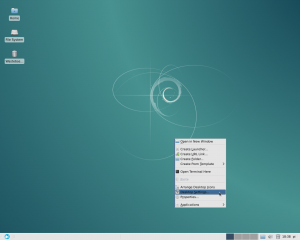 Unlike LXDE, you can configure XFCE up the ying-yang, making things look exactly the way you want. This will install a ton of dependencies, and will take a while to complete. The first time start XFCE, you’ll be prompted to set up your desktop. 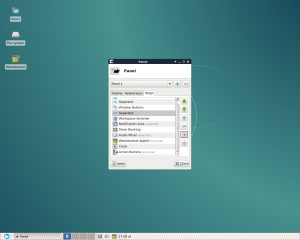 XFCE can be configured in a lot of different ways, and everyone has their own preference. Personally, I prefer something that looks kind of like an older Windows system with a bar at the bottom of the screen featuring an application menu, buttons to indicate running programs, and some status indicators, quick access menus, and the like. I’ll take you through my personal preferred setup in the next few steps, but feel free to customize things to your liking. First, click the “One empty panel” button in the dialog box. A small white box will appear near the top of the screen. The first panel will initially appear near the top of the screen. 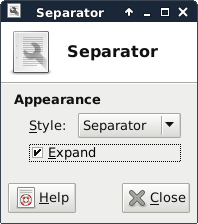 Right click on the panel and select Panel Preferences. 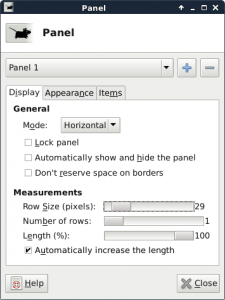 On the “Display” tab of the Panel dialog, set the mode to “Horizontal,” the row size to 32 pixels, number of rows to one, and the length to 100%. Sample settings for the panel. Most of the panel items have a set of preferences that go along with them which you can access by selecting the item you want to configure and clicking the properties button. It probably looks like a wrench on top of a sheet of paper and is located just below the “-“ button. You can explore the settings on your own, but to help make things look a little cleaner, choose the second separator and click the properties button. Then check the “Expand” checkbox and click “Close.” That pushes the items after the separator up against the right side of the screen and makes the panel look more balanced. Expanding the separator helps balance the look of the screen. Now close the Panel dialog. We’ve got our desktop set up, but it still looks a little blah. Let’s do something about that. 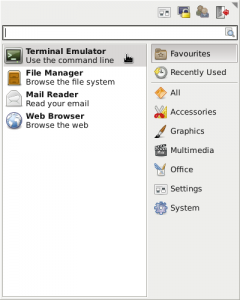 Use the newly added Whisker Menu to run the Terminal Emulator, which should be at the top of the list. running the terminal emulator from the Whisker Menu. Finally, we’ll install the Elementary icon set. ElementaryOS is a lesser-known Linux distribution, but it has one of the nicest, most professional looking sets of icons I’ve seen—and they work well with XFCE. While some Linux distributions have an XFCE-Elementary icon package available, Raspbian does not, so we’ll simply clone it from GitHub. Now open the Whisker Menu, type “appearance,” and open the “Appearance (Customize the look of your desktop)” applet that appears. On the Appearance dialog’s “Style” tab, you’ll see a long list of desktop themes. As you select them, your screen will change to show you a preview. 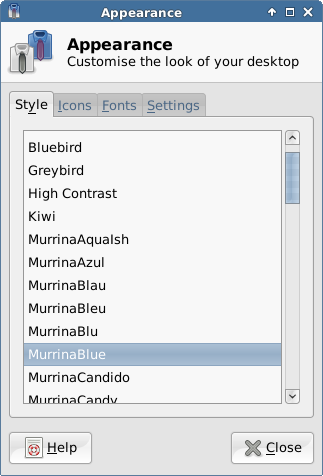 As I noted earlier, my go-to theme is currently MurrinaBlue. Next, click on the Icons tab. Again, as you click through the various options, you’ll see the desktop change. Choose “elementary” (not “elementary Xubuntu dark”). Click the “+” icon to add additional wallpaper imeages. In the “Add Image File(s)” dialog, click in the whitespace of the file listing (middle box) and start typing /usr/share/pixel-wallpaper and then press enter. Click on the first image (aurora.jpg), then scroll to the bottom of the list, hold down Shift, and click on the last image (waterfall.jpg) to select the entire set of images. Then click add. Now select your wallpaper and close the Desktop dialog. 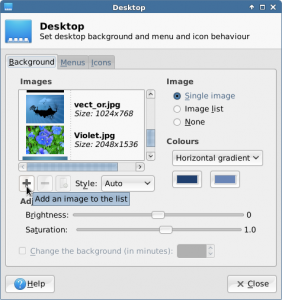 Selecting all of the PIXEL wallpaper images will make them available in the XFCE Desktop Properties window. Now that we’ve gotten everything set up, you’ll probably want to open a terminal window and run raspi-config again. Go to “Boot Options,” and “Desktop / CLI,” and chose to boot to “Desktop” instead of the default, command-line interface. Reboot when prompted. That should be enough to get you started. There is, of course, a ton of other software you can install, depending on your needs. Poke around on the Internet and you’ll be sure to find applications to do just about anything you want. 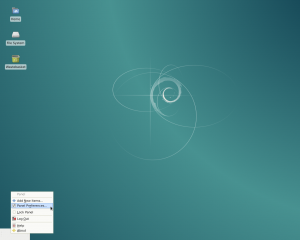 When you rebooted after switching to the “Desktop” login, you probably noticed that the default Debian wallpaper appeared under the login dialog. Want to change that? If you don’t like vi, feel free to use your preferred editor (such as nano), but if you’re going to be a Linux user understanding vi is a very useful skill that you should really take the time to learn. And don’t worry, I’ll clearly explain everything. Press the / key (forward slash) to search the file and then type background (without the quotes, of course), followed by the n key (for “next match,” since the word background appears once before in the file), which will jump you to where the login screen’s wallpaper image is set. Use the arrow keys to position the cursor on the first / after the equals sign and press the c key (for “change”), followed by the $ key (shift is required), which tells vi that you want to edit everything to the end of the line. When you’re done typing, press the esc key and then type :wq (colon, w, q, which tells vi to write the file back to disk and then quit. Now reboot the Pi again and you should see a much more welcoming login screen. Now that you’re on your quest for software to install on your Pi, it might make sense for you to install a graphical package manager. Let’s face it, using apt-get to install packages or run updates is pretty easy, but using the command line to search for packages? Not so much. Synaptic will automatically add itself to the Whisker Menu (under “System,” but the default settings use an internal mechanism for prompting for the root user’s password to get the necessary privileges to install packages. By default, most Debian-based OSes, such as Raspberry don’t set a root password, so the menu item won’t work. This creates a new synaptic.desktop file in /usr/local/share/applications with an updated command in it. Without getting into the differences between /usr and /usr/local, the file in /usr/local will take precedence over the one in /usr, and we don’t have to worry about it getting overwritten when an updated package is released. Now, when you select Synaptic from the Whisker Menu, you should get right in to the app without being prompted for an non-existing password. Sometimes you may want to add your own items to your Whisker Menu. While it’s not too difficult to manually write the .desktop files yourself, there’s a much easier way: using a menu editor. One such menu editor that’s available for the Pi is called MenuLibre. MenuLibre will add itself as “Menu Editor” to the Accessories and Settings menus in Whisker Menu. Run it and you’ll have access to tweak any of your system’s menu items, or even add new ones. Sometimes it’s easier to work with a standalone app than it is to use a web app in a browser—if you want to keep an eye open for to a chat or you need to copy and paste from other windows, it’s much easier to do if the app isn’t buried in a million tabs. Unfortunately on Linux, and especially on non-x86-based Linux, there are often no native apps available for the services I want to use. I’ve been a fan of single site browsers—tools that let you wrap a web application into a stand alone desktop application—for quite some time. I originally discovered (and blogged about) Mozilla Prism back in the early 2000’s (though back then, I didn’t really see the point). Later, when I switched over to Macs and OSX, I found Fluid, which has been helpful for a handful of tools I use. Nowadays, with Raspberry Pis being a hobby, I was looking for something similar. Even though a lot of the apps I use everyday are starting to support Linux, many do not distribute versions that are compatible with the PI’s ARM processor. Having a SSB for the Pi would be great…and, as it turns out, it can be done! 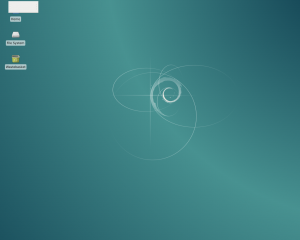 Peppermint is a Debian-based OS that features an SSB tool, called Ice, as one of it’s main selling features. Unfortunately, Peppermint won’t run on the Pi, but I figured with a little work, I might be able to get Ice to run. Ice, it turns out, is just a Python app, so it wasn’t difficult at all…I just needed to figure out a bunch of dependencies. While Iceweasel works, Chromium seems to be a little more flexible, so you might want to consider adding it as well. I’ve found kusti8‘s unofficial Chromium repo to be helpful in this regard. 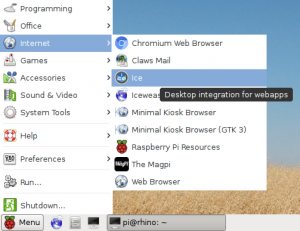 Ice icon in the Raspberry Pi programs menu. 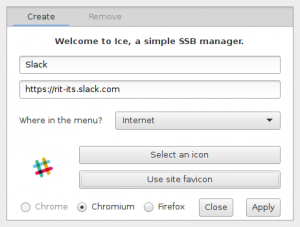 Configuring Ice to run Slack as an application. An icon for Slack has been added to the programs menu. Running my new Slack app brings me to the Slack login page. 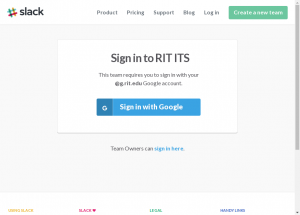 Just a quick login and I’ll be collaborating with my team! The newly created Ice app showing the Slack login page.